Happy Halloween cookies, brownies and cake pops for Halloween. Send these Halloween treats as gifts or feature them at your Halloween party. Great candy treats for Halloween parties and costume parties this holiday! These yummy Halloween food treats make great Halloween gifts for college students, friends, teachers, family and colleagues. Chocolate, fudgey, fresh-baked brownies from Veronica’s Treats are glazed in a delectable white chocolate flavored icing and topped with a custom design. 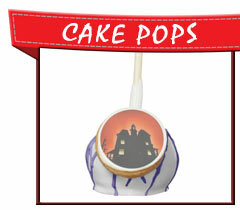 They’re a one-of-a-kind dessert for your special Halloween party or event. 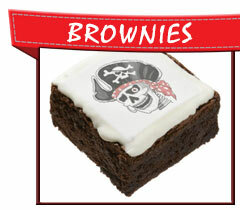 Brownies come in two sizes: approximately 2″ x 2″ squares and 3.5″ x 2″ rectangles. Make your party pop with a dozen bite-sized cake pops from Veronica’s Treats. Choose from three cake flavors, three flavors of icing, and ten drizzle colors to custom build a cake pop that suits your taste. 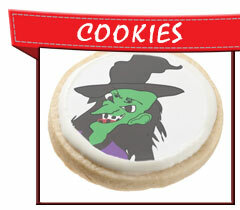 Gourmet shortbread cookies feature custom designs for Halloween! Made with all natural, quality ingredients, Modern Bite cookies provide a sweet and special touch for parties, trick-or-treaters and family. Baked fresh to order in small, buttery-sweet batches, these cookies are coated in delicious royal icing and then decorated with fun Halloween designs. Chocolate dipped Oreos® with Halloween designs distributed by Veronica’s Treats. These Oreo cookies, covered in white or milk chocolate, are perfect for gifting or Halloween party favors and treats. Individually wrapped in cello bags. Your designs and images are printed with FDA approved food ink on 100% edible frosting sheets. Stays fresh for up to 6 months.